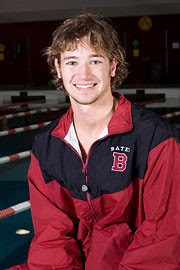 Co-captain Chris Berry (Augusta, Maine) had a big hand in an impressive first home meet for the Bates swimming and diving teams against Bowdoin on Saturday. The Bates men finished the meet with another pool record performance in the 400 freestyle relay, as Berry and first-years Ned Scott (Maplewood, N.J.), Tom Boniface (Youngstown, Ohio) and Nathaniel Depew (Hudson, Ohio) touched the wall in 3:17.00. The previous mark of 3:17.86 had been established in 1993 by Wesleyan. Berry and teammates also would have claimed the pool record in the 400 medley relay as well, although the Polar Bears touched the wall first to claim the mark for themselves with a 3:39.57 performance. Swimming in 3:40.05 for Bates were Berry, first-year Alex McKeown (South Windsor, Conn.), Scott and first-year Dan Aupi (Branford, Conn.). The previous mark of 3:39.57 was established by Bates alumni Eric Bowden, Adam Eggert, Nate Curll and Todd Bretl. Berry also claimed first place in the 100-yard backstroke race, registering a time of 55.65 seconds. 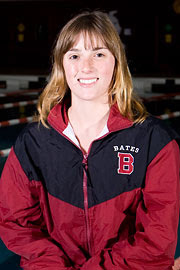 Bates first-year swimmer Kara Leasure (Los Alamos, N.M.) notched three season best times in three quite different events, and won all three of those events at last Saturday's dual meet at Colby. Leasure swam the 1,000-yard freestyle in 10:50.54, the 100 breaststroke in 1:10.68 and the 500 free in 5:17.61. "All were done with more heart than ever expected," said Bates head coach Peter Casares. "She not only showed the conference that she is one of the best, but she taught both the coaching staff and team what true determination looks like."